A 12 year old that changed language, and a few other things. Google is celebrating its 12th birthday today. 1998 was a good year? 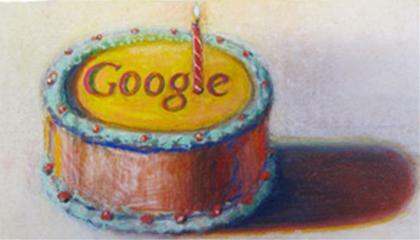 Google's regular logo has been replaced by an image of a cake, created by the American painter Wayne Thiebaud. 1920 was a better year. Wayne Thiebaud was born on November 15, 1920. Google plus an 89 year old painter what does this equal? Thiebaud spoke at Harvard University School of Design in 1990 where he responded to one of the student’s questions, “What do you think defines an artist? Can’t find an affordable solution for the purchase of your Vytorin? You’ve found it now! Buy it for $1.3 only! ” and Mr. Thiebaud responded “An artist creates his own world.” Long before anything or anyone would know what a Google was, Mr. Thiebaud knew why baked goods were essential to life and why technology is not. The story below is one of a place we all travel to in his paintings. Google is smart, but Wayne Thiebaud is good. He is his own technology. Wayne Thiebaud’s retrospective at the Whitney Museum of American Art in 2001 was a show organized to honor his 80th birthday. As far as Google’s birthday is concerned, today’s logo change solidifies the notion that Google’s birthday is, indeed, September 27. Google had previously been unclear about the exact date, sometimes celebrating on September 7, although the Google.com domain was registered on September 15, 1997. Mr. Thiebaud is a living national treasure. Do you think Google will be around 89 years? Mr. Thiebaud’s favorite poet is William Carlos Williams.